A beery boozy journey with delightful snacks along the way and a book in my hand. Oh this gets top marks for beauty: a light amber, toffee coloured ale with a perfect creamy head, but will it taste as good as it looks? The blend of malt and hops makes this a crisp, dry and refreshing ale; I was surprised that I didn't pick up any metallic taste with it featuring so much in the aroma. It's quite fizzy and a little oily in the mouth with a subtle citrus bitterness in the aftertaste. With just enough malts scraping through to make it quite an enjoyable bitter but, at a paltry 3.4% ABV, it wouldn't be one I would necessarily recommend to bitter lovers, however, I think it would be a perfect crisp, refreshing and thirst quenching drink on a summer's day more suited to pale ale fans. A traditional looking IPA; deep golden yellow with a slightly off-white frothy head. There is a bit of sediment in the bottle so you have to pour it slowly and carefully to get a lovely clear ale. The head is amazingly robust and lasts right down to the last drop. There isn't a strong aroma but what comes through are yellow fruits; predominantly lemon, grapefruit and pineapple. As you know, I'm not a fan of the very citrussy beers so this is nice and subtle and not off-putting at all. I was really surprised with the taste as it is a lot sweeter than I expected. It's an IPA so it is citrussy but the sweetness takes the edge off it perfectly. The aftertaste is also quite pleasant; it's bitter as expected but is more juicy grapefruit than lemon squeezy washing up liquid, so that gets a thumbs up from me. It's quite fizzy in the mouth; tickling the tongue like sherbet. It's not often I really enjoy an IPA but I really liked this one. As St Austell have used American hops instead of the traditional Citra hops, the sweetness counteracts the bitterness and blends perfectly to create a very palatable drink for this dark ale lover. What a vision of coppery loveliness! This is a beautiful molten toffee copper coloured ale with a very robust, tight cream head. The head appears so smooth, very much like a Guinness. It's well named 'Hoppy Holidays' as the initial aroma of hops and sweet malts gives way to delicious Christmassy smells of red berries and a touch of cinnamon spiciness. The taste is surprisingly bitter with a hint of lemon coming through after the first burst of toffee and malt biscuits. I noticed the bitter citrus less as I drank it and the smooth malty flavours intensified. It's softly carbonated giving a smooth but slightly thin feel and that oh so impressive head clings on for dear life right until the very last drop. 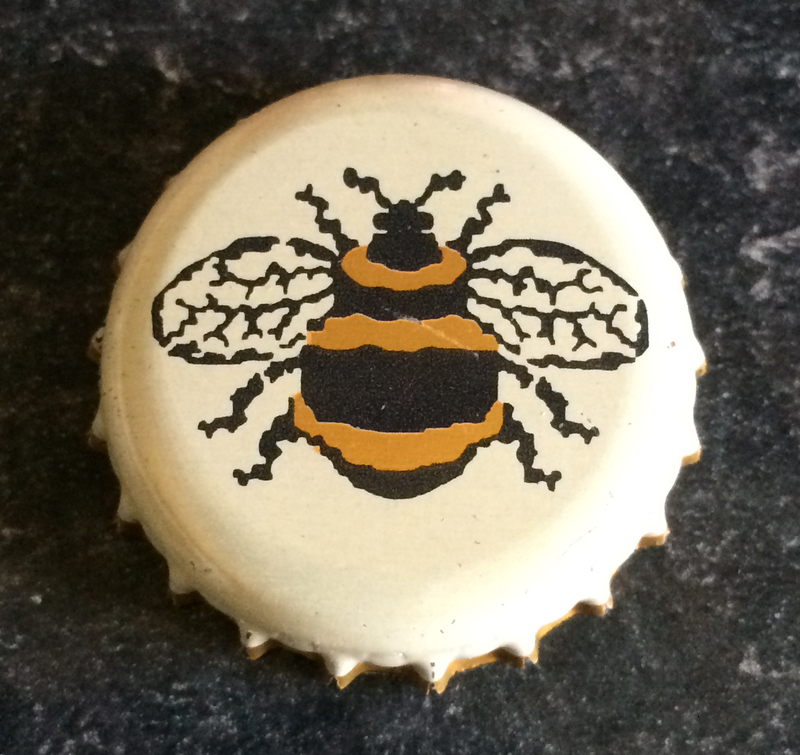 I have to say that I do love the honey bee caps on Brakspear ales, so I had to take a photo to share with you if you haven't seen one. Smooth and malty, I wouldn't call it a Christmas ale but I'd definitely have another one if I was looking for a light bitter. I love the crazy Pac-Man style images on the can of this stout by Magic Rock Brewing and the stout looks pretty amazing too. It's dark and almost black, apart from a ruby tinge when you hold it up to the light, and it has a tight dark beige head as you would expect from a classic stout. The aroma is out of this world; predominately chocolate and malt with a slight whiff of freshly brewed coffee. The taste, however, is even better as you experience a huge dose of liquorice and malt followed by bitter chocolate and sweet bramble fruits. Lightly carbonated, it has a very smooth feel and slips down far too easily for its strong ABV of 6.0%. Despite the head being small, it leaves good lacing on the glass. Dark Arts gives Guinness a run for its money in the stout stakes. It's lighter and fizzier than Guinness but much tastier. I loved the intense maltiness and Ale Be Seeing You Again, Dark Arts! I do think that you are always guaranteed a good beer from Wychwood and King Goblin is no exception. I love the look of this one: a warm amber, ruby tinged colour topped off with a loose beige head, however, the head does disappear quite quickly, leaving a thin foamy layer. There isn't a strong aroma, although what I could smell reminded me of dark red fruits, sweet malts and warm spices. It's quite fizzy to start with but it has a lovely treacle taste and a liquorice aftertaste. The taste of sweet black treacle lingers on the tongue until your next mouthful...and in my case, I didn't have long to wait. It's a shame the head didn't last very long at all as it gives it a flat appearance which belies the yummy taste you're about to experience. For me, King Goblin was absolutely divine and Ale Be Seeing You Again! Just my kind of colour! A beautiful dark copper coloured amber ale with a thick frothy cream head that, despite first appearances, disappears to a thin layer. It has a mouthwatering aroma of fruit and sweet malts with a slight hint of hops so I couldn't wait to dive in. I was certainly not disappointed as the sublime malty flavour exploded on my tongue. The bitterness of the hops is perfectly balanced with the sweetness of the malts, which left a very pleasant sweet aftertaste. The carbonation is perfect for an amber ale with gentle bubbles giving a very smooth feel as it slips down far too easily. Wadworth 6X really surprised me; I think I was perhaps a little guilty of judging a book by its cover as the label did nothing to entice me. 6X can be perfectly described by 2 idioms (is it just me that thinks of the 2 silly bulls moment in Blackadder whenever I think of grammatical nouns?). Anyway, the two very apt idioms I was thinking of are: appearances can be deceptive and it's what's inside that counts. 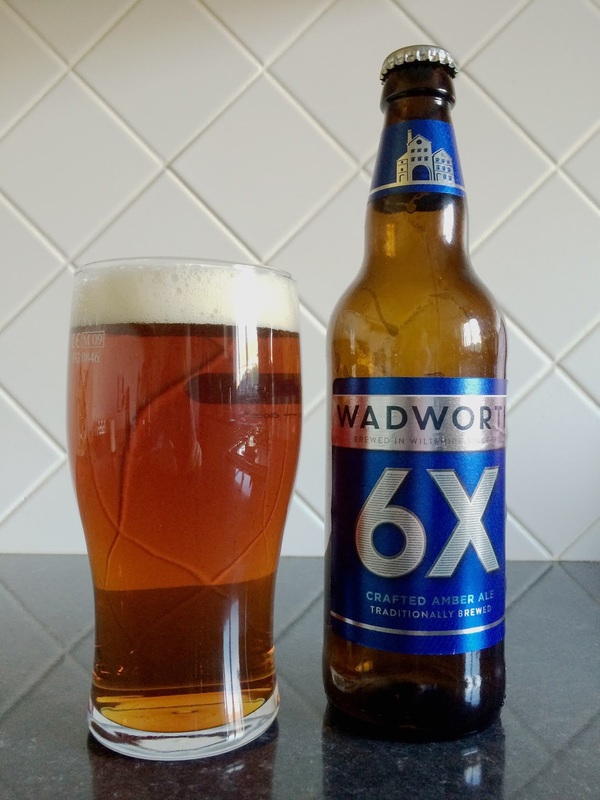 Ale be delighted to see Wadworth 6X again! A pale golden ale with very energetic bubbles that rush to the surface to maintain the little white head right to the end. It doesn't have a strong aroma but there's a definite whiff of hops and sweet malts with a hint of banana. There is a subtle mix of flavours as the tangy hops mix with the sweet malt. It doesn't have a strong taste as it's only a 3.9% ABV ale but it does have a nice bitter aftertaste. The bitterness has a lovely dry finish with no hint of citrus as the tongue tingling bubbles burst on your tongue. It is quite fizzy and relatively thin and would get a rating of 'canny' (not bad) here in the North East as opposed to 'belter' (top notch) for a five star ale. I'm passionate about the 3 b's - Beer, Books and Bryan Adams. 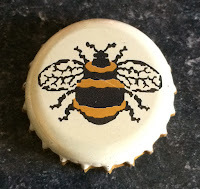 I have a book blog called The Book Magnet which records all the books I have read, so I created Ale be Seeing You so that when I get excited about a beer I can share it online. Yes, I do get excited about beer! I feel very fortunate to live in the North East of England surrounded by some great breweries - we have Jarrow, Wylam, Allendale, Durham, Mordue and my newly discovered Tyne Bank Brewery to name but a few. My favourites are copper/ruby ales but I like a bit of variety so expand my range to include IPA and stout when the mood takes me. 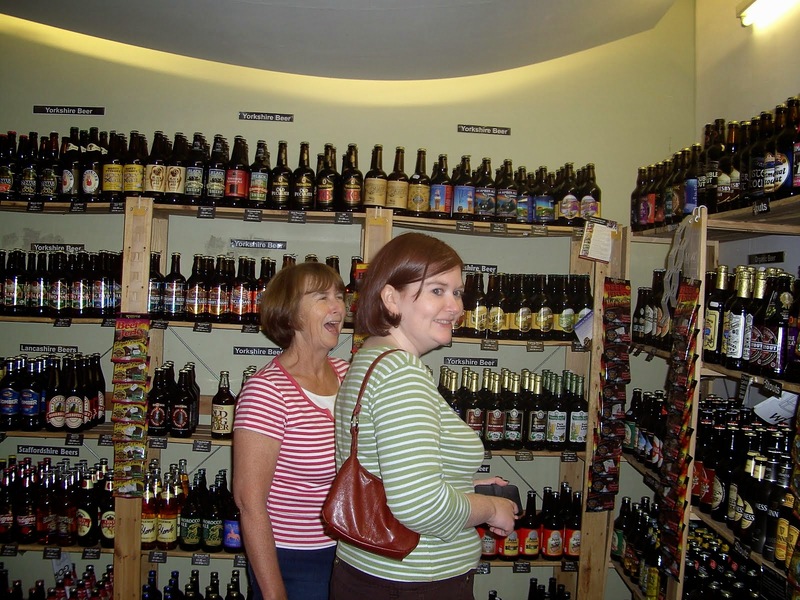 Shelly in a beer shop - the purse is out!